PassionScape by Hazel Mills: Is Monogomy An Unrealistic Expectation? You know, it seems that more often than not, we hear of relationships vanishing because one or both of the partners are seeking love and affection elsewhere. Nowadays, celebrity break-ups due to infidelity are the norm. We even take bets on how long the marriage will last from the moment we get wind of the news. Sadly, this does not only apply to celebs. The same is true for everyday joes. What happened to the sanctity of the once honorable institution of marriage? PassionScape poses the question: Is monogomy an unrealistic expectation? All month long, you will hear from some of today’s most talented authors and poets on this issue. It is my belief that no one who truly loves is expecting anything other than a monogamous relationship. Loves totally, it never grows old. Anyone who truly loves, gives of themselves unselfishly. and support for that undying love. Learns who they love are also friends and will remain to the end. Is a life long task. In this day and age, the question makes you wonder, it makes you ponder on if a man can stay true and not run astray from his woman, thinking that the grass is greener on the other side, and if a woman can stick by her man faithfully. I believe less people are getting married and more seemed to be getting a divorce or separation. We are in a different era of lifestyle, personality, control and obsession. There is a lot of temptation in the world. And in the twenty-first century where more and more of us our are gaining our individual independence, networking more, socializing more, running our own business and even working more, this adds to the stress and sometimes lessens our priority on maintaining and keeping up with a healthy relationship. What ever happened to true love? What ever happened to black love? Is it unrealistic to think black love is slim to none and that staying monogamous is nil? Sometimes it really does make me wonder. But back to the point – If a man and woman care about each other, I mean truly love and find passion in each other than I would say monogamy is realistic. But honestly, I’m going to tell you what I really think. I think monogamy is even more realistic if you put God and prayer in your life and in your relationship. Without God in a relationship it just leaves too much room for Satan to enter and cause disruption and confusion. So there has to be some type of spiritual connection and then yes, I believe monogamy is realistic. This month, PassionScape catches up with Xpress Yourself Publishing’s romance author, Victoria Wells, to discuss her bestselling contemporary romance novel, A Special Summer. I had the pleasure of meeting Victoria in May during Afr’Am Festival held in Norfolk, Virginia. She is a remarkable woman who is very passionate about her work. Victoria is not shy when it comes to talking about her latest release or about sharing her experiences in the publishing industry. VICTORIA WELLS is a Philadelphia native. In 1991 she graduated from Community College of Philadelphia under her legal name Gaye Riddick-Burden with an Associate Degree in Applied Sciences majoring in Nursing. She furthered her education and went on to earn a Bachelor’s and Master’s Degrees in Nursing from LaSalle University. Wells (Riddick-Burden) is employed as an adult nurse practitioner at a center city hospital. She has dedicated her fifteen year career as a nurse to taking care of patients with sickle cell disease. On March 19, 2006, Wells was awarded the Movers and Shakers Award presented by the American Women’s Heritage Society, National Association of University Women, National Association of Phi Delta Kappa, Top Ladies of Distinction and Two Thousand African American Women. This recognition was bestowed upon Wells because of her dedication to the nursing profession and community outreach. Wells has been a lover of books since childhood. As a child she would spend hours reading. To this day reading remains a favorite pastime. Wells’ favorite genre is African American romance. While taking a creative writing course in college, Wells became interested in writing. The final assignment for the course was to rewrite the last chapter of The Color Purple. Wells received not only an A for the assignment, but for the course as well. Professionally, Wells has written and lectured extensively on sickle cell disease. However, in 2005 after being encouraged by family and friends, she decided to pick up her pen and write her first romance novel. A Special Summeris Wells’ first novel which she self-published and will be re-released by XYP in 2008. Wells is married with three children, she and her family live in the Philadelphia area. HM: I have just finished reading your book, A Special Summer and it is wonderful. Tell us a little about the book. VW: A Special Summer is a romance about a love that is all consuming. It’s also truly a story of redemption and forgiveness. The heroine of the story Summer is experiencing her first encounter of being in love with Nick who happens to be a much older, powerful, successful businessman. Because of demons and unresolved family issues from Nick’s past life, Summer is literally flung into a world of pandemonium when he believes she’s betrayed him. When he finally sees things as they really are, Nick is in jeopardy of losing the only woman who has ever truly loved him unconditionally. HM: What inspired you to write A Special Summer? VW: I loooove African American romance novels. After reading so many great stories over the years I wanted to write my own story about us being in love. With so many negative stereotypes floating out there I wanted to create African American characters that were strong, positive and self-sufficient. My desire was also to be another voice in this genre that let it be known we are capable of loving and respecting each other. We do work through our relationship issues and take our responsibilities seriously. Speaking from the perspective of an African American woman it was important for me to say loud and proud that our men do know how to cherish us and love us. In addition, we as women do love and support our men when all isn’t perfect in our relationships. HM: How long was the journey from concept to publication? VW: The process took me about a year and a half. Initially, I toyed with the idea of writing a romance novel. I got up the courage after numerous friends and family told me. “Girl, you go can do it.” After writing my story I decided to self-publish it. After receiving overwhelming positive feedback I submitted my manuscript to three publishing houses, two were interested. In August of 2007 I accepted an offer from Xpress Yourself Publishing. HM: Who are a few of your favorite authors? VW: I have several! LOL My all time favorites are Francis Ray, Brenda Jackson, Beverly Jenkins, Leslie Esdaile, J.D. Mason, Rochelle Alers, and AlTonya Washington. Gwyneth Bolton and LaConnie Taylor-Jones are also authors that I’ve recently begun reading this year that’s pretty good. HM: What three pieces of advice would you give an aspiring author? VW: First, I would tell them not to let anyone steal their dreams. There will be a lot of folks who may pretend to be happy for you one minute and then the next discourage you in every way possible. Second, I would advise them to do research on the genre they wish to write. Finally, stay true to who you are as a person and as an author. HM: What can we expect in the future from Victoria Wells? VW: By God’s grace a ton of exciting romance novels! I’ve just recently completed my second manuscript, When Love Comes Around which is due for release early 2009 by Xpress Yourself Publishing. 3. One item you can’t live without and why: My bible. I need God’s strength everyday of my life. God speaks to me through His word. 6. Best childhood memory: Spending time with my grandmother. 10. Favorite thing to do on a rainy day: Stay in bed alternating every few hours between reading and watching Lifetime . Wondering why I’m a little late posting for June? Okay, I’ll tell you. With all that is going on in the world of politics, I have been on edge because whatever the outcome, groundbreaking history was inevitable with the possibility of either a woman or a African American man as the Democratic Nominee for the 2008 Presidential Election. After what was a sometimes heated race, Senator Barack Obama triumphed as the presumptive nominee of the Democratic Party. On Tuesday night, I shed a tear as I reflected on the wealth of pride our ancestors must feel as they enjoy the view from heaven. I wondered what Harriett Tudman or Malcolm X would say if they were asked to share their thoughts on this great milestone. When I learned that Senator Obama is slated to accept the nomination for President of the United States on August 28, forty-five years to the day after our most notable Civil Rights leader, Dr. Martin Luther King, Jr., stood on the steps of the Lincoln Memorial and delivered what is perhaps the most famous speech in American History, I couldn’t have been more proud. PassionScape is usually dedicated to romance and erotica but it is also about the passions that fuel our everyday lives. During the month of June, we will celebrate Father’s Day. In light of the enormity of recent events, I will spend the month celebrating all Black men. Not only will I uplift and celebrate my own husband, father and sons but I will also contemplate the entrepreneurial spirit of the brother hustling on the corner, trying to make ends meet for his family or the young man imprisoned and discarded by society for a crime he may or may not have committed. Will you join me? How will you celebrate Black men this month? Who will you pay tribute to? I want to hear from you. Feel free to share your thoughts and comments on the coming election and on our beautiful Black men. Happy Spring Beautiful People! Wow, it’s hard to believe that it is May already.The weather is warming, flowers are blooming and we are spending more and more time outside. I hope that you all are well on your way to accomplishing the goals you’ve set for 2008. Remember, 2008 is the year of new beginnings. This month, PassionScape features author and poet, Péron F. Long. His list of titles includes If It Ain’t Right, It’s Wrong and the recently released Pulpit Confessions. Péron is also a wonderfully talented poet. I was fortunate to have the oppportunity to briefly interview Péron about his art of writing. HM: I really enjoyed your poetic piece, Southern Swagger Girl. What inspired the poem Southern Swagger Girl? PFL: I attended a Frankie Beverly and Maze concert back in Oct. 07 and as they were singing “Southern Girl” thoughts began playing in my head, later that night I “Love Jones” came on and before I knew it the words to the poem were there. HM: I have read several of your poems. Are there any plans for a book of poetry? PFL: No Plans for a book of poetry. In reality I am not a poet, I only dabble in it from time to time. You know when the words appear. HM: Tell us about your latest release Pulpit Confessions. PFL: Pure DRAMA! LOL…. 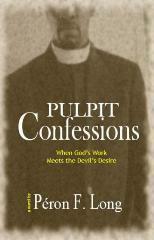 Pulpit Confessions is a story about transgressions and ultimately conviction. Basically we often see the outside of people. We never really get the opportunity to understand fully those who walk in the Light. I set out to create a story that chronicled the life of one individual that went full circle in how he was created into the person that he had become, who wrestled with the person he actually was. HM: How would you describe your writing style? PFL: I’m not even sure if I know what it is. If you read each of my works you will see that all are quite different. I work hard at trying to create entertaining stories while at the same time provoke societal views. HM: Do you base any of your work on real life experiences? PFL: I have used small amounts of real life experiences as a base but for the most part, my work is about 95% imagination. HM: What is the message that you want readers of Pulpit Confessions to come away with? PFL: The message that I hope to relay is one of understanding not only of conviction, but the process of conviction. We as a society often look for the results before the process. I always tell people that Salvation is a daily journey for some while a lifetime struggle for others. Without process there can be no positive results. HM: What is next from Peron F. Long? HM: What lessons have you learned as an author that you would like to share with aspiring writers? PFL: The most important things that I’ve learned that I often share with others, is do your research, hone your skill, do your research, hone your skill, do your…..Okay you get the point right? LOL…. Pulpit Confessions and If It Ain’t Right, It’s Wrong are available for purchase at www.amazon.com or wherever books are sold. Jane the Virgin recap: Is Michael back?